Lost baggage is one of the most maddening problems travelers face. It's also one of the most mysterious. So, the bag goes on the plane at the beginning of the flight  and just doesn't come off at the other end? Where exactly does it go? Is it sucked out the back when someone flushes the toilet? Is it eaten by a hungry passenger reluctant to pay $9 for a bad sandwich? These are the questions plaguing Lina Schillaci, who recently lost her luggage. The Complaint: In September, Schillaci was returning to New York City from Palermo, Italy. What she didn't know was that her suitcase wasn't coming with her. 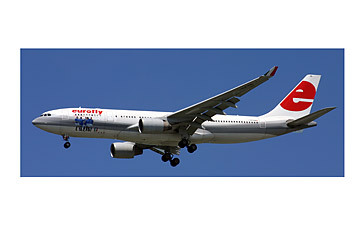 When her luggage failed to appear at JFK airport, Schillaci filed a claim with Eurofly. She was especially desperate to get her bag back because it contained more than $1,000 worth of new clothes she'd bought in Italy. We're not talking T shirts from the Gap. These were fine Italian-made garments. After jumping through miles of bureaucratic hoops, including mailing and faxing her itinerary, her receipts, her ticket stubs  and perhaps a DNA sample  to Milan, Schillaci waited to hear from the airline. Nothing. That's when she contacted the Avenger. To continue investigating, however, Eurofly needed more information from Schillaci  specifically, paperwork they had already been sent at least twice. The paperwork was sent again. A couple of weeks later, the airline asked for the same paperwork again. The Avenger, on principle, refused to resend it. The airline was given nearly another month to reply, but so far it has done nothing to resolve the issue or reimburse Schillaci for her lost clothing. Grazie, fellas! But we haven't walked away completely empty-handed. We've at least learned this important lesson: if you're taking Eurofly, carry on anything you're planning to wear again.